It is most important to notice these. It is absolutely necessary for true interpretation. God's Word is made up of "words which the Holy Ghost teacheth" (1Cor. 2:13. 1Thess. 2:13. 2Tim. 3:16. 2Pet. 1:21, &c.). A "Figure of speech" relates to the form in which the words are used. It consists in the fact that a word or words are used out of their ordinary sense, or place, or manner, for the purpose of attracting our attention to what is thus said. A Figure of speech is a deigned and legitimate departure from the laws of language, in order to emphasize what is said. Hence in such Figures we have the Holy Spirit's own marking, so to speak, of His own words. This peculiar form or unusual manner may not be true, or so true, to the literal meaning of the words; but it is more true to their real sense, and truer to truth. Figures are never used but for the sake of emphasis. They can never, therefore, be ignored. Ignorance of Figures of speech has led to the grossest errors, which have been caused either from taking literally what is figurative, or from taking figuratively what is literal. the alteration or change, of a word, or words, or their sense. The 181 which follow are arranged in alphabetical order for the sake of reference. (Genesis 1:2; 8:21. Psalm 74:11. Jeremiah 2:13< face="Verdana, ArFONT SIZE="-1"ial">. Hosea 11:10). Ascribing to God what belongs to human and rational beings, irrational creatures, or inanimate things. 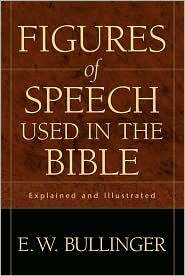 The only work on Biblical Figures of speech in the English language is by Dr. Bullinger (Published by Eyre and Spottiswoode, London, 1898. ), from which we have taken the whole of the information given here as well as the marginal notes. He has classified some 217 separate figures (some of them with many varieties or subdivisions), and has given over 8,000 illustrations.